Mid afternoon break | Oh Look, Krill! I was hungry and I wanted coffee. So I walked out to the nearest coffee place with decaf, since the cafés near the office do not carry decaf. 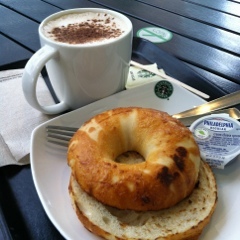 It started to rain when I arrived so I had a bagel to go with my coffee. I should get back soon since I need to keep my samples into the fridge. Good thing I have an umbrella. Categories: Coffee, Life | Permalink.